"Today, François de Fossa needs little introduction. His name and his music are well established in the serious repertoire of the guitar. One salient aspect of de Fossa’s creative output was the relatively large number of arrangements that he made for the two-guitar medium. Most of these arrangements are based on overtures to operas that were popular in France during the early decades of the nineteenth century. 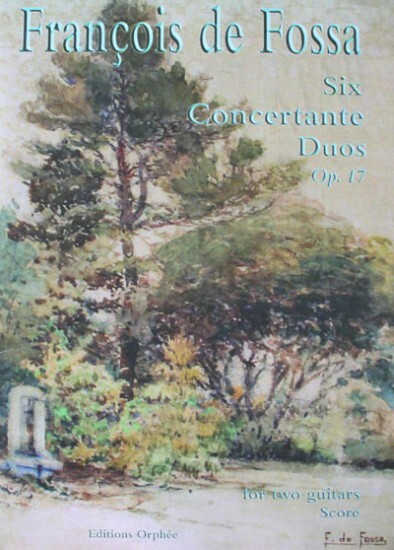 But perhaps the most daring endeavors in this direction, were de Fossa’s arrangements of the nine string quartets by Joseph Haydn and the present set of Six Concertante Duos based on the Six string quartets by Enrique Ataide y Portugal. One can only surmise on de Fossa’s motivation in arranging the music of a Spanish composer who was certainly not known in France. Most probably, he had known Enrique Ataide personally, having met him and his music during his own sojourn in Madrid during the years 1803-1810. These arrangements could have been made during the same period de Fossa had made the Haydn quartets arrangements. The structure of all six quartets, and of course the Concertante Duos on which they are based, is of a first movement in a Sonata-Allegro form, followed by a theme and variations movement, often in a Rondo format. Duo VI, the last in the collection, has one additional movement — an Allegro Fugato. The music of Ataide is fresh, ingenious and happy, even though it has scant formal pretensions. François de Fossa’s arrangement of this music for the two-guitar medium offers guitarists a direct access to eighteenth century Spanish chamber music as practiced by enlightened aficionados, the same people to whom Luigi Boccherini dedicated his string quartets (G. 171-76) — the Signori dilettanti di Madrid."